So you want to be a wedding photographer? Want to go pro, go full-time, ditch that desk and take the industry by storm? Stop and think about your life. Do you LOVE to work? Like, truly LOVE working? Not the recognition, not the money and the fame, and least of all the internal accomplishment feedback that comes from achieving small successes that only you can see. Nope, you pretty much need to love doing the work. 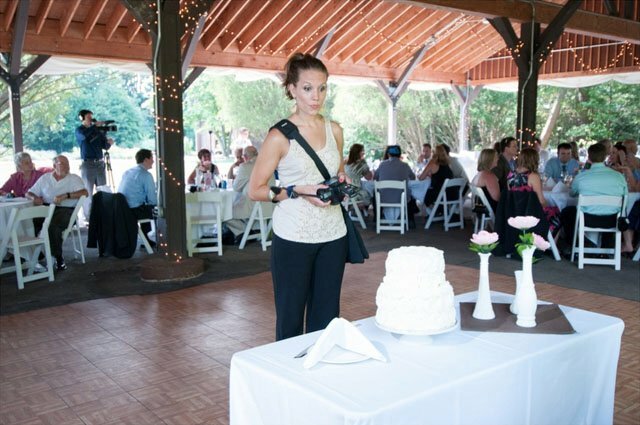 Many fantasize about becoming professional wedding photographers. When you see rock-star photographers, their glamorous lives, their cool hair and fast cars, you perhaps do not see the hours, days, weeks and years of hard and thankless work that got their stars a-rockin�. That�s understandable. And when you realize that many of the actual photographs produced by these top producers are not, in fact, much better than yours, it looks that much more appealing. But looks can be deceiving. All the work behind these very visible, public success stories is very hard to see, and there are good reasons for this. First, it�s not pretty and nobody would believe it anyway. We want our stars to be both common and magical. We want to believe that it�s possible for all of us to rise from the daily grind and ascend to stardom. And we don�t believe in the purgatory of work that must be crossed in the middle. Zach Gray shot school portraits, Jasmine Star was a lowly model for Mike Colon, Matt Kennedy�well, he kind of was a rock star already�and pretty much everybody else you�ve ever heard of, before they were full-time photographers, they were doing something else, and often that something was kind of lame. What are you doing now? Is it lame? Is it hard, thankless, tiresome, poorly-compensated, soul-wearying work? If you are thinking that wedding photography could be your ticket to a world without work, you are sadly mistaken and will be sorely disappointed. However, if you flat-out love the work of photography, crave the process, and are committed to the path, let�s talk about all the work required to live that life. Buying that first camera is hard. First, you have to save your money, stretch your credit or make do with what you can borrow or steal. Once you have become comfortable with this first piece of gear, you�ll need to keep pinching pennies to add some glass to that body. If you�re one of the more clever, forward-thinking types, you�ll invest carefully, knowing that each investment is built on the one before. However, at first, most everybody just kind of gets what they can get and grows from there. Just know that you�ll need to buy some stuff, and then more stuff, just to get your foot in the water. Are you already past this step? Already got the gear, got the feet wet, and you�re feeling quite superior to this noob we�re describing? Ah, good! Lookout stardom! Education is a lot of work. And it�s confusing! What should you be investing in? Star-Shooter�s Workflow-a-Matic? Magic Mike�s Marketing Mojo? Stunning Steve�s Technical Tricks? Ina�s Inspiration Shindig? Second shoot for a year or more? Yes, you probably need all of them. And you need to read the right books, watch the right videos, and listen to the right podcasts. You need to invest your free time in building up your toolkit of technical know-how, marketing methodologies and business basics. It�s not easy, but if you want to be a star, or at least pay your rent, you must constantly educate yourself. Marketing is work. It is not only mind-numbingly confusing, it is also soul-crushing at times � especially early on. Your fledgling efforts will fall flat. Your best-planned campaigns will come to naught. And many of the hard-earned dollars you �invest� will simply fly off into the void, never to be seen or heard from again. It�s like gambling, only every time you ante, you put in a little more of your self-esteem. Do you love a gamble? Why not take the risk! Meetings are work. Not only is it mentally exhausting to prepare for the meeting, the emotional investment is far more costly. And in the early days, your meetings will fall flat. Your sure-thing clients will go with somebody else. You may even begin to associate coffee with the taste of failure. But you�re in it to win it, so you push through, luring yet another doe-eyed couple into the local Starbucks for a piping hot cup of rejection. Prepping for a wedding is a TON of work. Congratulations, they choose you! Now the only problem is� photographing the wedding. You�ve done the second-shooting, but today is your day! Aaaand now you can stress out. Do you have backup batteries? What about a backup camera body? Do you have the right glass? Comfortable shoes? Body-Glide? Shot list? 15-hour Energy? Is your second shooter legit? Are you even asking yourself the right questions? The wedding day is nothing but work. There�s really no glamor on the wedding day. You�ll wear practical shoes, pants that breathe and a formal-but-comfortable shirt�kind of like an 80 year old on a beach trip. All in all, it�s a strenuous day of hard and thankless work, and when you finally fall into bed that night, the work is far from done. Post-production is work. You�re new to the business, so you are probably still operating under the false assumption that you need to do all the color-correction yourself. In Photoshop. You�ll design the album even though your client hasn�t purchased it yet. You�ll re-touch far more than you should. And you�ll take 40 hours to do it, because� reasons. What reasons? Well, you�re not super fast. You don�t know the keyboard shortcuts. And you�re still homing in on your look. And one more reason many photographers take far too long in post can be boiled down to this: while you�re editing, it still feels like you have a job. Once you finish the edit and deliver the goods, you�re no longer gainfully employed, and that feels kind of awful. So edit long and edit hard, because hooray work! Photography is far more work than just photography. Of course you know that � everybody in the business for five minutes knows that. But are you prepared to work in a field where nobody else knows that, assuming that all you do is drink coffee and click a button? Are you ready for the glitz and glamor of anonymous online criticism of your worst work, blatant image theft of your best work, and the sound of crickets when you share work into which you�ve poured your very soul? Are you ready to lose more sleep than a new parent? Ready to sweat more than a pro wrestler and earn less money than a fryer-cook? Ready to drive more miles in a year than a Texas cabby? Do you crave the excitement of countless email enquiries that never write back? Failed marketing campaigns? Free �for exposure� shoots that fail to bring a single client and friends-of-friends asking for a discount that nearly amounts to you paying them for the privilege of shooting their dumb wedding? Do you love people, a lot, even the un-lovely ones? Do you believe in yourself, even in the face of regular rejection? Do you love the process, even if the results don�t come for a long time? Do you love to work for no money and long, thankless hours? Is accomplishment itself enough compensation for you? Are you willing to work 7 years for your �overnight� success? Are you willing to pull an all-nighter because you love your clients? Are you motivated by your own creativity? Is your happiness unshakeable in the face of repeated defeat? Do you own a camera and a comfortable pair of shoes? If you answered �yes� to, literally, every single question, who knows, maybe you�re the next rock star wedding photographer. Maybe. About the author: Levi Wiggins is one half of Harder+Wiggins, which is based in Nashville, Tennessee. He works with his wife Shayna as a photography writer. This article was also published at KISS University.